Tired of delegating payment control to centralized third parties? Sick of waiting several days to walk away with only a percentage of your billed funds? We sure are, and with Magnet Merchant Tools, we provide the solution: online payments without the middleman. That means more trust and control: no more relying on a centralized third party, no payment reversal, and no fund withholding. Sounds ideal, but how is this possible? We’ll share, but first we’d like to provide a little bit more information about Magnet and where we’re heading. Magnet is a development-heavy cryptocurrency based upon the core ideas of transparency, accessibility, equality, and fairness. This is why we’ve been carefully and tirelessly working to develop a premier, revolutionary, and reliable payment solution for merchants and their clients. We’re growing towards becoming a transparent and accessible payment option for users to exchange value safely, because that’s a problem frequently faced in today’s digital world. We’d love to provide the best possible solution, and we think we’re well on our way. Allowing you to accept direct, wallet-to-wallet payments online, Magnet Merchant Tools is designed to provide the least possible amount of friction for users and merchants, and it’s our answer to the traditional payment setbacks that have stunted e-commerce growth. The Magnet Merchant Tools system automates invoice payments and direct transactions, allowing your users to checkout and pay faster, cheaper, and more securely with any MAG wallet. Invoice amounts are directly sent to the appropriate MAG wallet addresses, allowing users to instantaneously enjoy their well-deserved funds. Long gone are the days where waiting several days for payment was acceptable! Fortunately, the Magnet Merchant Tools setup process is fast, easy, and secure. Integrating Magnet payment buttons is frustration-free and allows for seamless product delivery directly within your checkout flow. Using our custom button generator, you’re only a few clicks away from integrating MAG payments into your website. Once you’re ready-to-go, you’ll be able to begin accepting MAG as payment for your products, services, and donations, benefiting from its unprecedented transaction speeds and increased access to funds. Better yet, you can rest assured that these funds will be in good hands: your hands. Keeping total control over your own, hard-earned funds, Magnet Merchant Tools allows you to use your own MAG address, and your private key is never stored nor sent to our servers; security truly is our main concern. Automatic Price Conversion: specify a price in USD or BTC and have it automatically converted to MAG on the user-presented invoice, hedging against market volatility and allowing receipt of a reliable amount of MAG. Payment Security Checkpoints: prevent users from editing payment button price fields and protect data integrity by ensuring buttons were created from the appropriate merchant account. Insightful Tracking Tools: login to your account at any time to manage invoices, view real-time charts for analysis, and check payment history. So, what are you waiting for? It’s time to dodge the middleman and Magnetize your website! You can sign up, free of charge, for your own MAG Merchant account today, allowing you and your customers to reap the system’s many payment benefits as soon as possible. 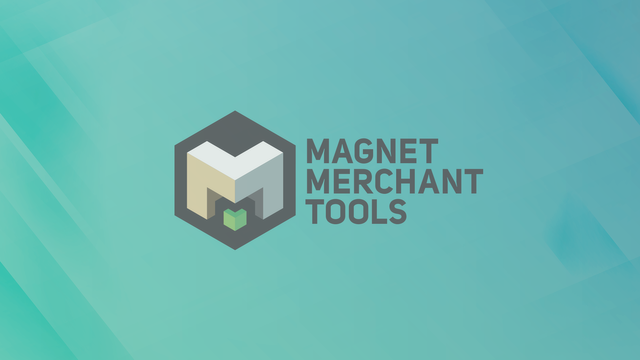 Check out https://merchant.magnetwork.io/ to learn more about how Magnet Merchant Tools can take your business to the next level.